Enjoy huge savings on Clearance items, up to 70% off storewide. 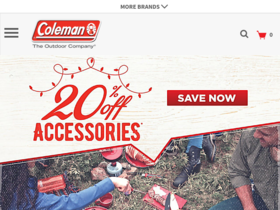 Sign up for emails with Coleman online and enjoy a 20% discount with coupon. Click this link to receive free shipping on all orders over $49. Act now! With the purchase of any grill, purchase any table at 50% off. Use this coupon to receive 15% - 30% savings on items storewide including: Airbeds, Tents, and Lanterns.